Above all, Gallocanta lagoon is a stopover for birds which fly from Northern European breeding grounds to places in the South of Spain and North Africa where they spend the winter. Bit there are also birds for whom it is a winter destination or a nesting ground in the summer months. These birds come from very different places (from France and the Netherlands, as well as Iceland, the Nordic countries and even as far away as Siberia). This diversity is also to be found in the variety of species which take part in this annual ritual. Towards the end of winter and the beginning of spring, the birds begin their journey back north towards their nesting grounds. Whereas from the summer to the beginning of winter the birds invert their route southwards towards their winter havens where they will spend the colder winter months. Not all species have the same “migration calendar” or come to the lagoon in the same numbers. 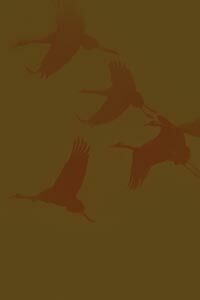 The most abundant species are the anatidae and the cranes above all. From October to March (with the exception of January) Gallocanta lagoon is a delight to the eyes and the ears. Over 40,000 cranes come to this wetland in large flocks, with their screeches and flapping of wings. An amazing spectacle at dawn and at sunset when their silhouettes dot the sky as they return to their roosts.